The Blog 508, ADA, WCAG: What’s the difference? Note: We at Logic Solutions are not attorneys and this blog post should not be considered legal advice. Clients often come to us looking for a new website or mobile app that is ADA-compliant, but not everyone is aware of exactly what it involves. When it comes to application development, it is important to know what the difference is between 508, ADA, and WCAG, and what level of compliance you’re interested in adhering to in order for the developers to best assist you with creating the perfect solution. In the interest of simplifying terminology, the phrase “ADA-compliant website” will be used as an umbrella term to indicate any website that is trying to be accessible to people with disabilities. It is not indicating a specific adherence to only ADA (thereby excluding 508 and) WCAG standards. What is 508, ADA, and WCAG? Technical Requirements: The coding of a website, software, operating system, etc needs to be compatible with assistive technologies. Function Requirements: The entire system should be usable by someone with a disability. Support Requirements: Support documents and alternative information should also be accessible by people with disabilities. Section 508 is a federal law that requires all electronic and information technology developed, procured, maintained, or used by the federal government be accessible to people with disabilities (Access-Board.gov). Technology is considered “accessible” if it can be used as effectively by people with disabilities as by those without. The American with Disabilities Act (ADA) is a civil rights law that “prohibits discrimination against individuals with disabilities in all areas of public life, including jobs, schools, transportation, and all public and private places that are open to the general public” (ADA National Network). The law guarantees equal opportunity for individuals with disabilities in public accommodations, employment, transportation, state and local government services, and telecommunications. The Web Content Accessibility Guidelines (WCAG), developed through the World Wide Web Consortium’s (W3C’s) Web Accessibility Initiative (WAI), are a series of guidelines for improving web accessibility to make websites and content accessible to users with disabilities and different devices (e.g. mobile phones). The current version, WCAG 2.0, was published in December 2008 and became an ISO standard in October 2012 (Wikipedia). ADA requires that businesses, state and local governments, and nonprofit services providers make accommodations for the disabled public to access the same services as able-bodied patrons. Movie theaters, digital media, websites, and ICT are required to be accessible to people with disabilities. WCAG is simply a set of formal guidelines on how to develop accessible web content. These standards represent a higher level of accessibility than 508 standards, although they are identical or very similar. WCAG focuses primarily on HTML accessibility. When it comes to compliance for websites and web applications, all three place slightly different emphasis on what items they consider higher or lower priority. There are times when WCAG has a more stringent standard, other times when there is only one 508 guideline but WCAG has two, and other times when 508 has a guideline but WCAG doesn’t (and vice versa). Large companies part of the federally-funded industry and private businesses can voluntarily be compliant. However, there is nothing in Section 508 that requires private websites to comply with their regulations unless they are receiving federal funds or are under contract with a federal agency. Because WCAG is only a set of guidelines (that many organizations and entities have agreed on), WCAG itself doesn’t have any official legal power to require compliance. However, many countries have adopted WCAG’s standards and required all websites to comply with them (e.g., United Kingdom, Canada, Australia), and other countries only require WCAG-compliance for only governmental websites. In general, it is recommended that any business with an online presence should provide accessibility to disabled users. So, do I need to be compliant? If you’re a business in the United States, the answer is most likely yes. If you already comply with ADA: Highly recommended. In 2010, the Department of Justice (DOJ) issued an Advanced Notice of Proposed Rulemaking to specifically ensure all websites, public and private, are subject to ADA compliance. The DOJ’s proposed amendments to the ADA were initially expected in Spring of 2016 but have now been pushed back to 2018. If you’re an international company or have a lot of international business, we recommend that you research each country’s specific requirements regarding accessibility compliance. What do the different levels of WCAG 2.0 conformance mean? Because 508 recently adopted WCAG’s standards for web accessibility, we’re going to look at WCAG’s levels of conformance. WCAG 2.0 success criteria are categorized to 3 different levels of conformance. Each level provides successively greater degrees of accessibility. Level A (minimum) – the most basic web accessibility features. The website MUST satisfy this checkpoint. Otherwise, one or more groups will find it impossible to access information in the document. Satisfying this checkpoint is a basic requirement for some groups to be able to use web documents. Level AA (mid-range) – deals with the biggest and most common barriers for disabled users. Website SHOULD satisfy this checkpoint. Otherwise, one or more groups will find it difficult to access information in the document. Satisfying this checkpoint will remove significant barriers to accessing Web documents. Level AAA (highest) – the highest level of web accessibility. A website MAY address this checkpoint. Otherwise, one or more groups will find it somewhat difficult to access information in the document. Satisfying this checkpoint will improve access to web documents. Conformance at a higher level indicates conformance at lower levels. For example, conformance to Level AA implies conformance to Level A. Do I really need a developer? Yes. Read our previous article on ADA-compliance for why we highly recommend that you use a web development expert to help you make sure your website is ADA-compliant. What should I know before I talk to a developer? When you approach a web development expert for accessibility compliance, they will most likely ask you questions similar to these. If you’ve already thought through these questions and have some answers prepared, it will help your developers get a much clearer idea of how they can best assist you. Which guidelines are you interested in adhering to: 508/ADA or WCAG? Do you have any additional special accessibility requirements? Do you have any international accessibility requirements that you need to follow? What kind of assessment reporting do you need – a report that is automatically generated by a compliance checker or a manually-written report? Who would you like to remediate issues that the assessment report found – you, the developer, or a combination? Do you need a certificate or statement verifying compliance? 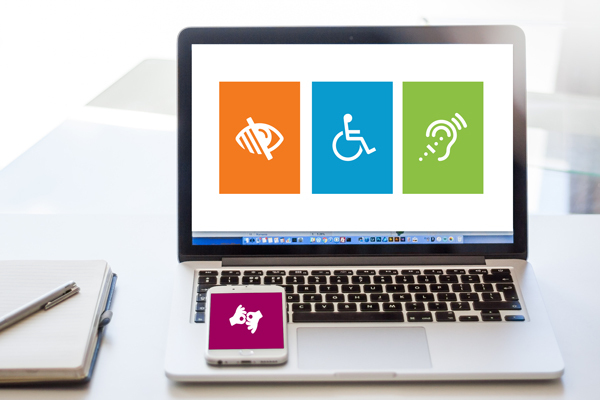 Do you require training in how to maintain an ADA-compliant website after it is launched?